Yeah, but: Time flies. Seriously. The Long Version: I encourage people to think that when things go quiet around here that it's because I'm working on something big, like world peace or a major camera-related review. Sadly, though, it often just means that I've found a new computer game. 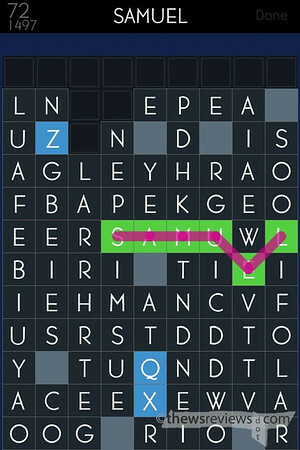 These days I've been playing Spell Tower, by Zach Gage, which is a neat little game for iOS that Penny got me hooked on. 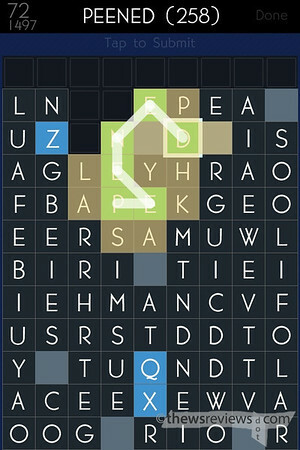 It's a word-finder remove-the-blocks puzzle, with different gameplay modes that allow free play on a fixed board or various reverse-tetris don't-reach-the-top challenges. I don't seek out stress, and usually play the "no pressure" game. I do terribly at Scrabble but reasonably well at Boggle, and I'm pleased to say that the technique is more like the latter with some of the odd not-really-words of the former. All told, a fair trade. The user interface is good, but in my case is limited by the phones' screen size. I'll occasionally select words that I wasn't trying for, usually while on my way to building something that would have given me a higher score, simply because I have a hard time accurately hitting the little letter boxes on my iPhone screen. I'm pretty hopeless at dragging to select the letters, especially when doubling back and working on diagonals, but tapping is just a little better. An "undo" command would be a very, very nice addition. Tapping is also good because it shows the points total before committing, and sometimes there are better combinations that aren't intuitive. 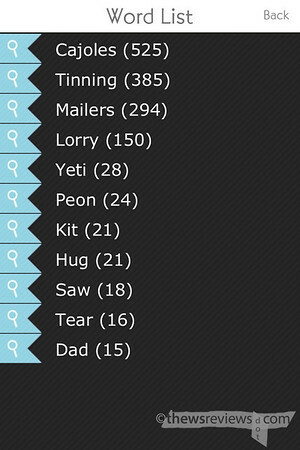 I played one game where "hugs" was worth fewer points than "guns", so it's good to check. The game has American overtones in other ways, too: "zed" isn't an acceptable word, despite being used in almost every English-speaking country, but the nonsense word "zee" is. "Jesus" is a recognized word, but my nephew's name isn't despite also being mentioned in the Bible. I accidentally discovered that Shri is an alternative spelling for Sri, which is an Indian honourific derived from Sanscrit; I still have no idea what a "bez" is despite it earning me sixty points. 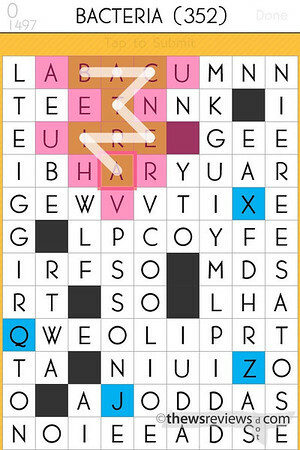 This is one reason why I detest high-level Scrabble games, but at least with Spell Tower these can be discovered by happenstance. I still feel better about completing games when I can use all of the words in a sentence, though. I have to say that I really like the font that Mr. Gage chose for the display. It's very easy to tell "E" from "F" and "B" from "R" despite having all of the letters in majuscule. There's also a white-on-black "night colors" option that tames the screen brightness, which I prefer to the standard display. That's useful enough to let me forgive the too-loud-by-default sound effects. A nice touch is the list all of the words found during the game, presented along with a link to the iOS dictionary if it's a legitimate one. I'm routinely surprised by just how few words there are when the game is finished – it always feels like there should have been more. I've yet to actually time myself playing a game, but I suspect that it's considerably longer than it feels like, as well. That, at least, can be a good sign. 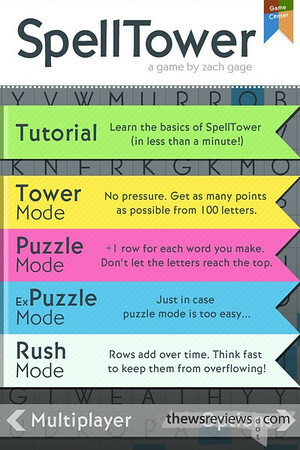 All told, Spell Tower is a simple and enjoyable little game that easily justifies the price of the download. There is room for a little more refinement in the interface, but that's true for me, too. Highly recommended. Updated 26 September: I just downloaded an update and now it has locked all of the levels until I go through the tutorial or score a certain number of points in various things, and it resets itself to the maximum effects volume. That's just obnoxious – I've marked its score down accordingly.